Islander and her family used to watch the original “Hawaii 5-0” on TV back in the 1970s. The series lasted from 1968-1980 and starred Jack Lord as Detective Steve McGarrett. Thirty years later, in 2010, “Hawaii 5-0” was rebooted, with Alex O’Loughlin as the lead actor. Islander saw his co-stars, Scott Caan (Detective Danny “Danno” Williams) and Teilor Grubbs (who plays his daughter Grace) while they were filming a scene at the Hilton Hawaiian Village. She and a curious crowd waited around three hours to watch them but the final scene in the aired episode lasted three minutes! We are gearing up to watch another season of “Hawaii 5-0” premiering this fall. The Hilton Hawaiian Village hosts viewing parties as well. Why not eat an aptly named trail mix while watching the episodes (or reruns)? 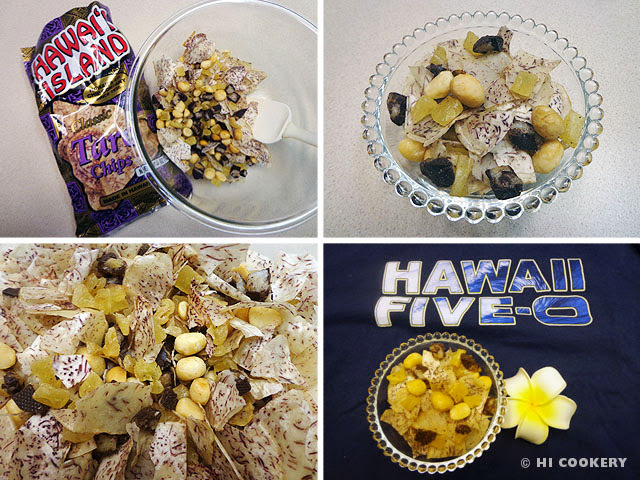 There are only five ingredients in the “Hawaii 5-0” trail mix recipe so it is easy to make for a snack. Also try this tasty tropical treat on National Trail Mix Day! Chop the dried pineapple and crystallized ginger into small pieces. Dice the Mounds candy bar into little bits. 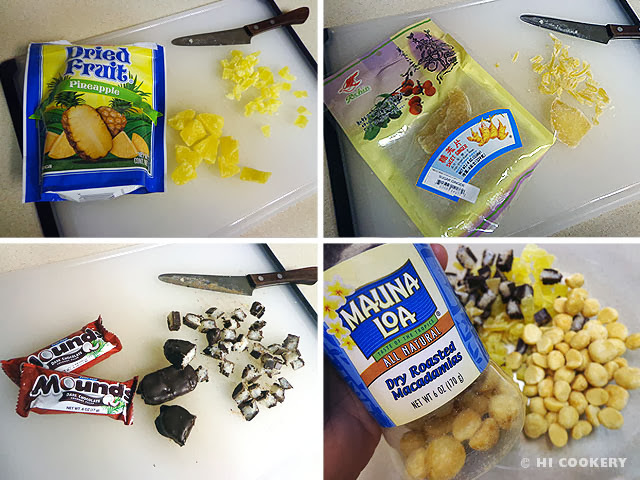 Place the pineapple, ginger and candy, along with the macadamia nuts, in a large bowl. Add the taro chips to the mix, breaking the larger chips into smaller pieces. Combine well and serve immediately. Or package them an airtight container until ready to eat. Find bags of taro chips by Terra Chips at mainland grocers. Some specialty health/natural food stores and Asian markets might sell taro chips as well. 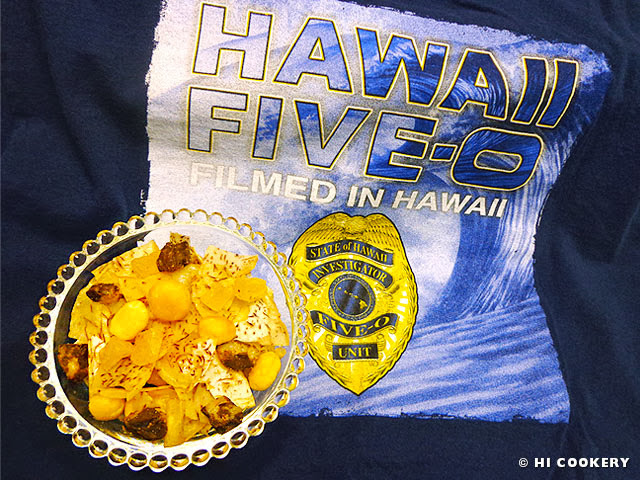 The final food photo of the tropical trail mix was taken against the backdrop of Islander’s “Hawaii 5-0” tee shirt. Islander took the photos of the cast and crew while they were filming on the grounds of the Hilton Hawaiian Village on Aug. 29, 2012. The segment they were shooting was part of “Hawaii 5-0” season 3, episode 6, number 53. “I Ka Wa Mamua” (“In a Time Past”) aired on Nov. 12, 2012.